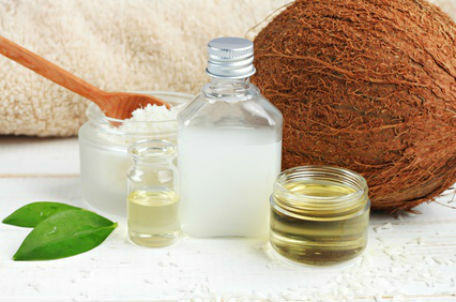 Coconut oil has made its mark in the recent past due to its remarkable therapeutic properties. It is therefore becoming popular for use in different areas. Coconut oil has fat which provides our body with energy. Since coconut oil is edible, the idea of using it for you hair and skin might be a distant one. Coconut oil is inarguably the best natural skin moisturizer out there. Normally, coconut oil is solid at room temperature, but it melts when applied to the skin leaving it sparkling clean. It does not leave a greasy or sticky feeling when you apply it. To moisturize your skin, put a quarter teaspoon coconut oil in your palm and rub it. Apply to your skin and massage gently. Wait for around ten minutes for the oil to get absorbed and wipe out the extra with a soft cotton towel. Coconut oil has therapeutic properties that help the skin to fight against fungal infections. Several fungal infections are minor; however infections such as ringworm and yeast infections can develop from small patches of dry skin very fast. By applying coconut oil, you can get rid of these infections. Our skin comes into contact will a lot of bacteria. Coconut oil has antibacterial properties that protect your skin from bacterial infections. The antibacterial agent in Coconut oil is known as Lauric acid(1). By using coconut oil on a regular basis, you keep bacterial infections at bay. While applying Coconut oil on your skin cannot protect you from sunburn for a whole day, it can effectively protect you from sunburn for a brief period of time. If you want to take an hour walk, you do not have applied a sunscreen. Just apply coconut oil and you will be protected. Premature aging of the skin occurs due to oxidation caused by UV rays, injuries, harsh chemicals and environmental pollution. By moisturizing the skin, coconut oil exfoliates without abrading the skin. It also acts as a physical barrier to chemicals, environmental pollutants, dust while retaining skin moisture. Coconut oil antioxidant properties reduce the level of oxidative damage. Additionally, coconut oil keeps your skin supple making you look young and radiant. More often than not, removing makeup is a daunting task. Removing your make up is ideal as it allows your skin to breathe. Removing makeup can be irritating especially if it does not come off easily. This is when coconut oil comes in handy. Coconut oil is a great grease cutter. To remove makeup, apply coconut oil and leave it on for around 5 minutes, then wash the make-up off with warm water and mild soap. Collagen is what keeps our skin smooth and elastic. Due to exposure to sun, aging, pollution, physical injuries and several other factors; collagen breaks down. So it’s important for the skin to replace collagen to avoid formation of wrinkles. Coconut oil has the ability to penetrate deep into the skin where it attracts protein molecules ensuring that the collagen layer is repaired. For optimal skin health, it is important to deep cleanse our face regularly. The skin on the face is exposed to a lot of dust, pollutants, chemicals and other harsh materials. The toxins from these pollutants bore deep into skin pores clogging them. Once clogged, the skin pores can develop keratin caps which keeps sebum trapped in the follicles. Coconut oil is a gentle and thorough cleanser. By applying coconut oil to your face, it softens the keratin caps making exfoliation much easier. Do you have a problem of dry flaky scalp or dandruff? Then, coconut oil is the way to go. Coconut oil keeps your hair and scalp moisturized which keeps your hair looking shiny and discourages formation of dandruff. The days of spending hours trying to choose the best hair and skin products are finally over. With coconut oil, your hair and skin are fully protected. You can either make coconut oil at home or just buy from the store. Want more ideas try Olive oil skin care.